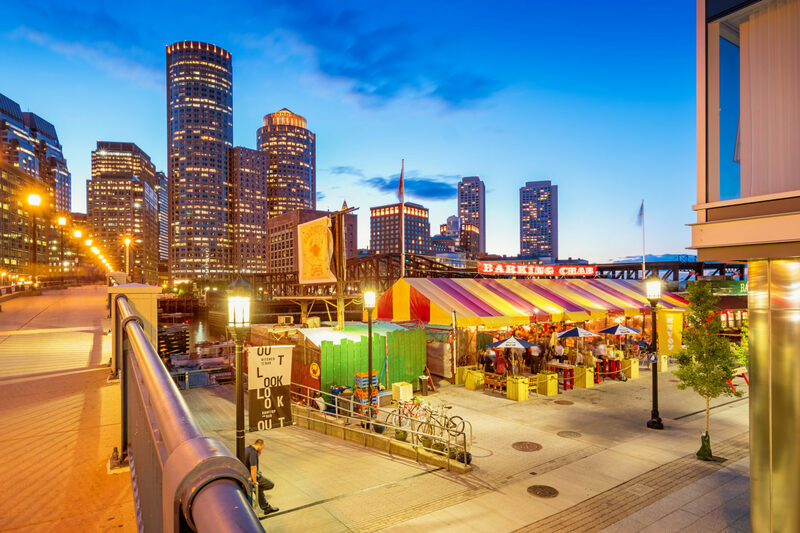 Whether you’re an oyster fanatic or a chowder devotee, you’ll find plenty of seafood to sample in Boston. The state’s devotion to seafood makes sense. Thanks to more than 1,500 miles of shoreline, the National Oceanic and Atmospheric Administration calculates that Massachusetts hauls in the third most valuable annual catch in the country (behind only Alaska and Maine). In other words: we’re up to our gills in scales and tails. For visitors to Boston, it can be easy to get overwhelmed by all the ocean-fresh bounty. Here are some of my favorite spots to hit when I have a hankering for oysters, a yen for chowder, a longing for lobster rolls… you get the idea. Ready, set, go fish. When I was a foodie-in-training fresh out of Boston University, the flavor descriptors at Neptune Oyster were a revelation. I never knew the briny treasures could contain such tastebud-tingling multitudes: honeydew, sweet butter, popcorn, nuts. As expected, the rotating oysters list at this bustling North End eatery is heavy on regional varieties, but a few west coast oysters also make the cut. 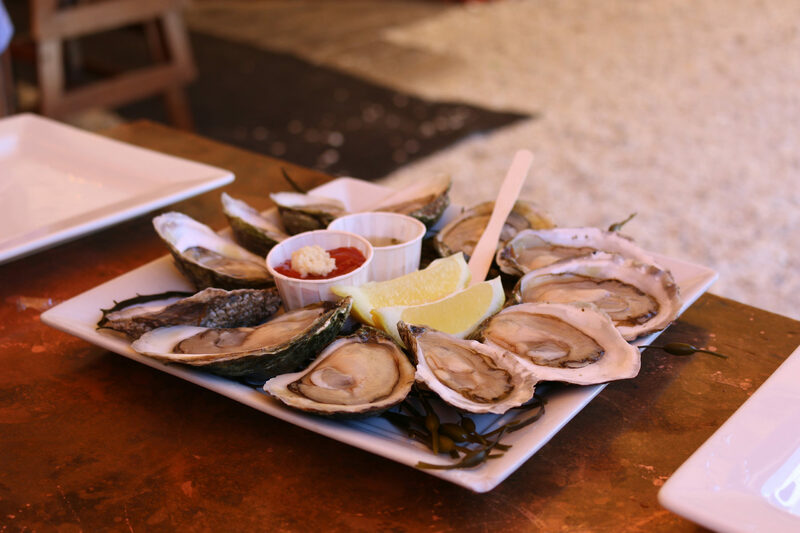 Trust me, there’s nothing better than sidling up to the marble bar on a steamy summer afternoon for a just-shucked dozen on ice and a chilly glass of rosé. If you’re instead near Seaport District, pair your bivalves with guezes and IPAs at Row 34. A list of intriguing pours beckons from breweries near (Mystic Brewery out of Chelsea, Massachusetts) and far (Brasserie d’Orval from Belgium). Lightning-fast with an oyster knife? Prove it in the shucking contest — or kick back with a lobster bake and Harpoon Brewery pints — at the annual Boston Seafood Festival at (where else?) Fish Pier on August 5. Dive into a staggering selection of canned — mostly Portuguese and Spanish — cockles, octopus, tuna, anchovies and more at Saltie Girl, a sweet jewel box of a restaurant with mermaid figureheads jutting from ocean-teal walls. 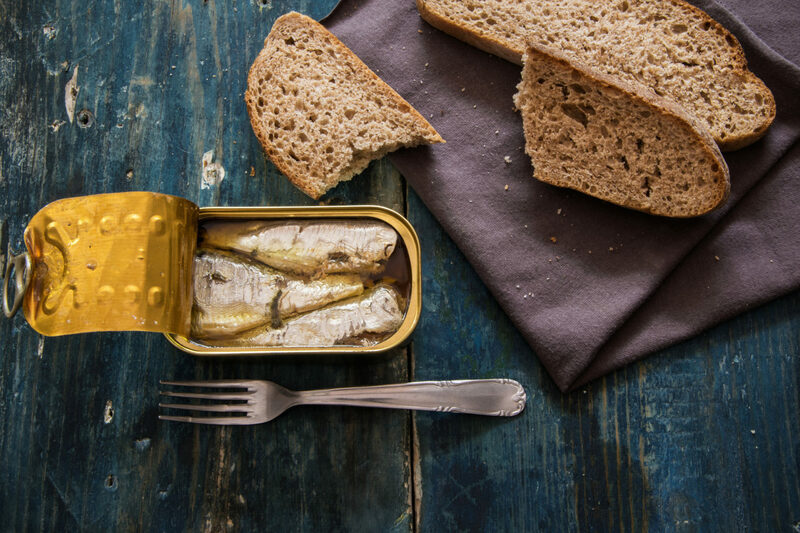 On a recent visit, our sardines in olive oil came with hunks of artisan bread, a piquillo-pepper spread, and three types of salt and house-churned butter — almost a meal in itself. Smaller still is wine bar Haley.Henry, which is upping Downtown Crossing’s cool quotient with pét-nat pours and an array of trendy tinned fish for all your snacking needs. I need more crudo in my life — or at least that’s what I think every time I polish off a plate of Hawaiian kampachi with blood orange, chili and radish at the light, bright Bar Mezzana in Boston’s South End. Thankfully, chef/partner Colin Lynch offers a six-crudo sampler so you can prolong the raw-fish bliss before tucking into one of the lick-the-plate-good pastas (if tagliolini with crab, Meyer lemon and chili is on the menu, order it). And for crudo with a side of Red Sox, Maine’s cult-favorite oyster purveyor Eventide now has a casual, counter-service outpost in the Fenway neighborhood. 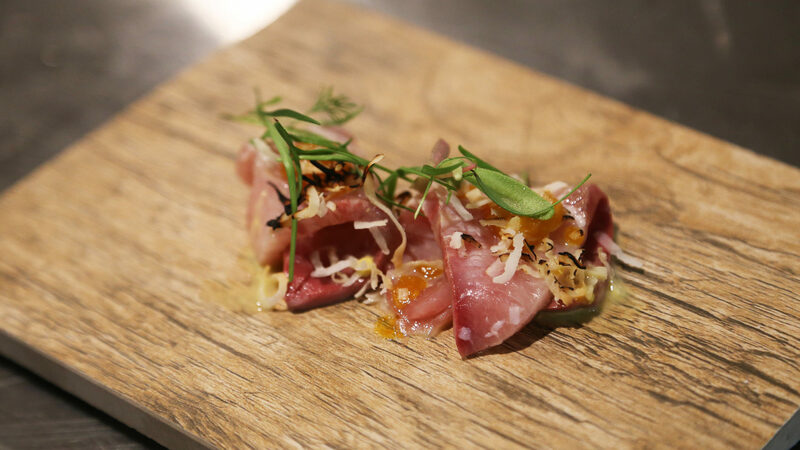 The eatery dishes out stellar hamachi, salmon and tuna crudo. I usually insist on savoring this summer treat with water views, but I make an exception for Alive and Kicking. 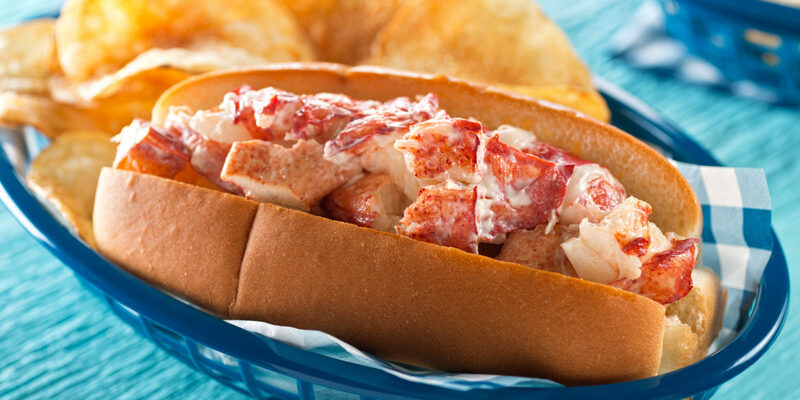 Here’s why: the stand, tucked into a residential side street in Cambridgeport, serves lightly dressed lobster between two slices of buttered, seeded scali toast — not on the traditional split-top roll — which ensures a perfect meat-to-bread ratio in every bite. 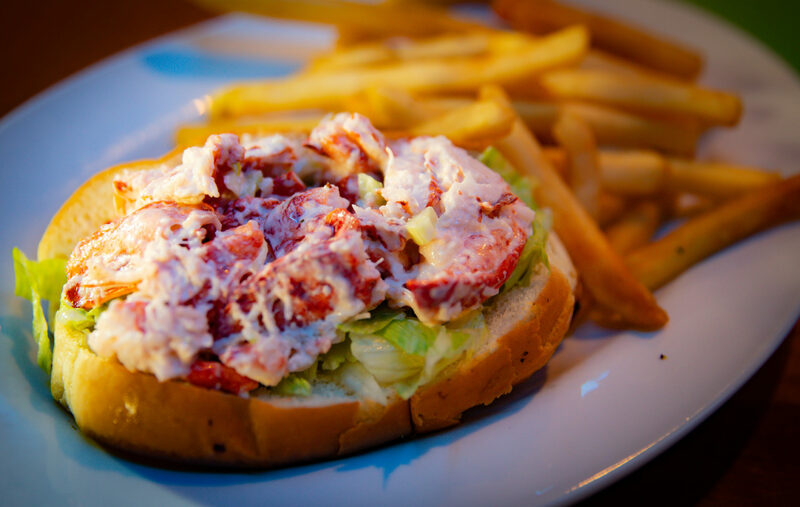 And considering you can see the Logan Airport runways from Winthrop’s Belle Isle Seafood, stopping there for an over-stuffed lobster roll on your way into or out of town (or both!) is a no-brainer. When Barbara Lynch’s B&G Oysters opened in 2003, it ushered in a new wave of oyster spots. And although the South End stalwart continues to offer a dozen-plus bivalves daily, it prepares all types of fish insanely well. 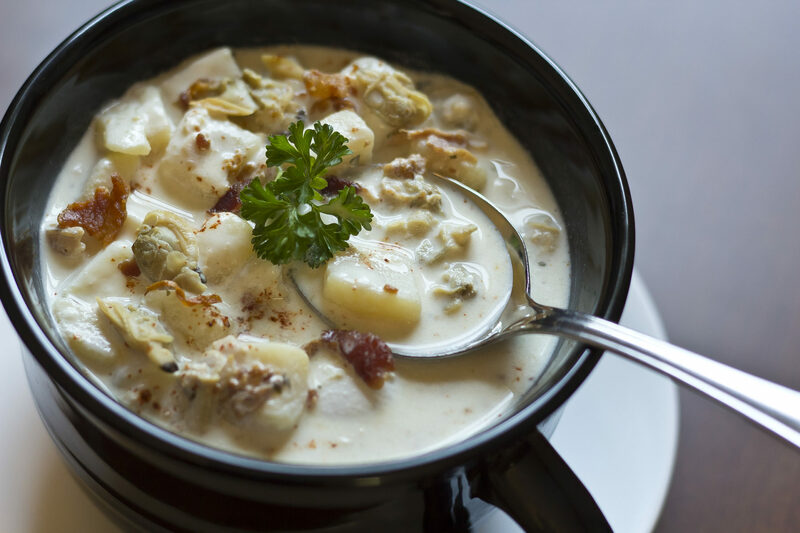 Case in point: B&G’s rich yet balanced take on the all-important New England staple clam chowder sings with smoky bacon lardons and spicy croutons. I also suggest trying Legal Seafoods (one of those rare chains that locals actually frequent). You’ll discover chowder so creamy-good that it’s been on the inauguration menu of every president since Ronald Reagan. As high-rises and hotels sprout around it, the 24-year-old Seaport institution The Barking Crab continues to reel in crowds clamoring for a come-as-you-are seafood shack experience downtown. Under a can’t-miss yellow-and-red striped tent, strung with twinkling lights and buoys — and dotted with signs stating that requests to turn down the music will be ignored — locals and tourists alike crack claws and slurp littlenecks. And there’s no better place in Boston to sample a true Yankee delicacy: plump, saline fried clam bellies. Ah, summer. For even fewer frills, head across the Fort Point Channel to James Hook + Co. and savor “lobsta” bisque at an umbrella-shaded table in the parking lot. To get your seafood fix on the go, pop into Boston Public Market. You can stock up on heavenly smoked bluefish pâté at Boston Smoked Fish Co., and grab monkfish tacos or a lobster BLT from the Red’s Best counter. Current status: Drooling. Courtney H. is a writer living in Boston, Massachusetts.